Our partner Fortum opened its new world-class central city heating plant in the northeast of central Stockholm (in Värtahamnen) earlier today and invited VIP:s to tour the facilities. Dignities including Swedish energy minister Ibrahim Baylan and world-renowned nature photographer Mattias Klum took turns on stage praising the joint initiative in Stockholm City. 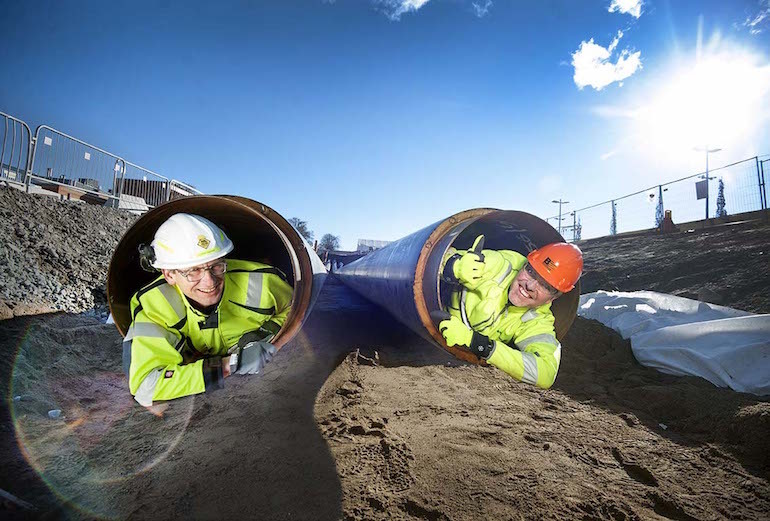 Anders Egelrud, CEO Fortum och Jon Karlung, CEO Bahnhof, closely inspecting pipes that’ll exchange excess heat from computer hardware into the city’s central heating system. As pipes for water exchange have already been dug down in the ground from this new power plant and towards our new climate positive data center we’re looking forward to moving from the planning/design phase and onto construction.